MANILA, Philippines - Senator Ferdinand "Bongbong" R. Marcos, Jr. decried on Thursday the Department of Justice's shabby treatment of the kin of the 44 commandos of the Special Action Force commandos slain in the Mamasapano massacre. Marcos said his privilege speech last Tuesday was prompted, among others, by actual requests, sent to him through e-mails, from the family of one of the SAF 44 requesting his assistance to seek justice for the slain police officer and complaining of questionable delays in the preliminary investigation of the cases pending before the DOJ. He noted that in the first e-mail sent to him dated December 8, 2015, the SAF 44 kin, whom he did not name for security reasons, complained about the cancellation of the scheduled preliminary investigation on the Mamasapano case on November 11 and 27. The complainant noted that the Nov. 27 hearing was cancelled anew despite the presence of the representatives of 35 SAF commandos from the 55th Seaborne Company as well as the lawyers of some of the respondents. 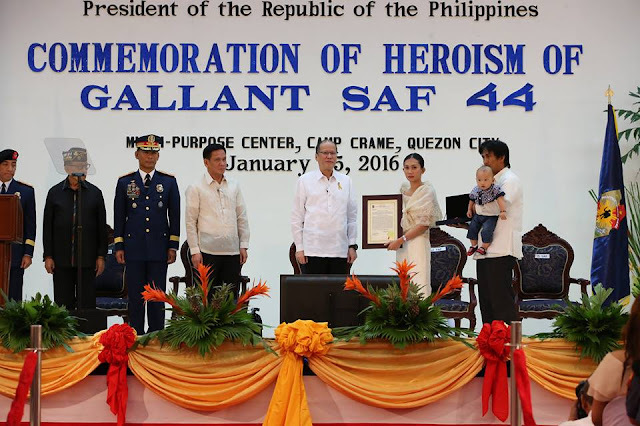 "Many of the families of the slain SAF 55 are from Visayas and Mindanao. We were travel weary and we spent money for our fare in going to Luzon and hotel accommodation only to be informed later that the hearing is cancelled," the letter-sender said. In a subsequent e-mail to Marcos, dated January 18, 2016 the SAF 44 kin said they were again told the scheduled January 14, 2016 hearing was cancelled because the case is already submitted for resolution. "If this is how we treat those that have given their lives in defense of the country, what fate for the ordinary citizen? What fate for those we love and care for in life?" Marcos said. Marcos further noted that upon receiving the first e-mail, he immediately wrote then Acting Justice Secretary Alfredo Caguioa on the status of the preliminary investigation but he has yet to receive any response. "More than a month has passed since I wrote the DoJ to endorse that email for appropriate action but until now I have not received even a cursory reply to assure that they would attend to the matter," Marcos noted. With the appointment of Caguioa to the Supreme Court, Marcos had also urged his replacement, undersecretary Emmanuel Caparas to prioritize the resolution of the Mamasapano case, noting that a year after the tragic incident no case has been filed in court against the suspects. He said no word or gesture can assuage the pain of the families of the slain policemen.